Quintessentially coastal! 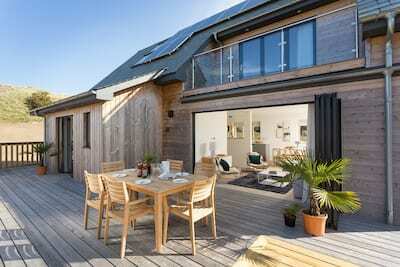 Soak up the seaside vibe of Gwynndreth and enjoy the sand, sea and Cornish scenery from your holiday door. 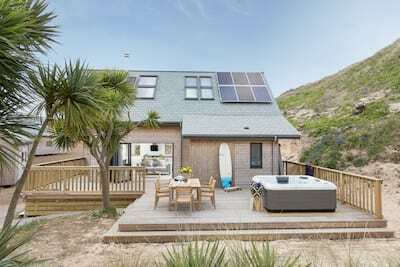 This wonderful holiday home-from-home sits atop the golden sand dunes of Hayle, North Cornwall and offers the perfect destination from which to explore. The house is set over two floors and offers 3 beautiful bedrooms including 2 master bedrooms overlooking the ever-changing Atlantic views. Follow the winding roads and arrive to a quiet corner of holiday luxury. Once inside, Gwynndreth oozes coastal character from the red, white and blue décor, oak wooden floors and of course panoramic sea views. 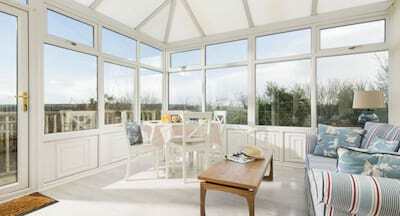 The open plan living, dining and kitchen space has been thoughtfully laid out for holiday life in all seasons. The spacious kitchen welcomes the budding chef in the party with ample storage and kitchen kit with which to get creative. Choose to dine al fresco as the sun sets offering the perfect backdrop or gather as a group around the chunky scrub dining table for lazy breakfasts and simple suppers. Considered pockets of seating ensure larger parties have space to relax and unwind away from the hubbub of holiday life. A circular dining table with comfortable wicker armchairs sits in a jackpot position to enjoy the comings and goings of St Ives Bay over a mornings coffee. Sink into sofas beside the woodburner, pull up an armchair with a good book or keep abrest of current affairs in the tucked away TV space. Located at the rear of Gwynndreth is a charming king bedded room (zip/lock) decked out in cool coastal fabrics with adjacent contemporary shower room. A central wooden staircase leads to the apex of the house with two beautiful master bedrooms, each a mirrored footprint of one another. Indulgent super king (zip/lock) beds ensure a good nights rest and floor to ceiling sliding glass doors lead onto a wrap around balcony overlooking the bay. The finest linens, inspired artwork and stylish ensuite bathrooms complete the luxury ambience. Enjoy the luxury of the location with large lush green lawn leading down to the coastal path. Step out from the living space and enjoy a healthy dose of vitamin sea, the garden offers a perfect place to wile away the days. To the side of Gwynndreth is a large paved area with outside dining table and 6 chairs plus built in charcoal BBQ. From the end of the garden, lead onto the coast path and down onto the beach in just a few minutes. Hayle Towans Beach is one of the most beautiful golden sand beaches in Cornwall stretching 3 miles with views across the bay to St Ives. This breathtaking stretch of coastline is popular with surfers and kite-sufers, catch the action from the comfort of your holiday home or embrace the elements yourself for a day in the water. The nearby town of Hayle has much to offer from artisan bakeries, cool cafes and the RSPB Estuary which teems with wildlife. Take advantage of the Park and Ride from Saltings Reach and travel the branch line train into the cosmopolitan coastal town of St Ives, a wonderful harbour settings brimming with boutique shops, galleries and tempting places to eat. Whether you are a smaller party or full house of six, swap your city wardrobe for beach chic and enjoy a luxury holiday with seaside twist. Outside cool shower - perfect for de-sanding and de-salting after a day on the coast! One small step down from the parking area. Please note that the parking is suited to one medium car and one small car only and access is narrow. A stunning property. We absolutely loved our stay in Gwynndreth. It was beautiful. We were able to have our individual space and be together. Waking up to that view every morning was an absolute joy. It is genuinely the best bed I have ever slept in. Hopefully will come again and would recommend the property and Cornish Gems to friends. Beautiful house that has every thing you need with the most fabulous view, can't wait to stay there again. We felt really at home and relaxed. Thank you to the owners for being generous in sharing their beautiful home. We have used many holiday rental companies over the years. Cornish Gems are by far the best. Cleanliness is high on my priorities and I have yet to be disappointed. Location and quality of you're accommodation is fantastic. Customers service is impeccable. When In Cornwall you are my first choice of agent. Thank you. Have already booked to come back next year!! Thanks. Superb property with unbelievable views, would definitely book again. Thank you Cornish Gems for a brilliant holiday! This was our second stay in a Cornish Gems property and we were not disappointed. Beautiful property, comfortable and well-equipped. We have recommended Cornish Gems many times to friends and family and will certainly book with you again. As always the property was wonderful and Cornish Gem staff helpful, friendly and efficient. Always recommending you to friends! We thought the property was to a very good standard. Gwynndreth was an exceptional property. We had a lovely break at Gwynndreth. The house was beautiful and location superb.